Peter Barnes: Hello, Moya. You're a learning support teacher. Moya Gibb-Smith: That's right, Peter. Peter: And how long have you been a learning support teacher? Moya: I've been a learning support teacher for about 11 years now. In actual fact though, I never really wanted to be a teacher at all. Peter: You didn't want to be a teacher, and yet 11 years later, you're still a teacher. Moya: I'm still a teacher, and I'm still loving it. Peter: How did that happen? Moya: Well, it was my mother who wanted me to be a teacher, but I was very reluctant. In fact, although I did my teacher training, I left teaching very shortly after I became a teacher and instead became a nurse and spent a number of years nursing, in fact a whole decade nursing. Eventually, I ended up in nurse education, and I was a diabetes educator. And then I spent another decade having my family, and then I wanted to go back to work. It was at that point that I was offered a job as a teacher's aide, teacher assistant, at my children's school. I did that for a number of years, sitting at the back of the classroom or sitting with an individual child who was having some learning difficulties. I thought to myself, "I reckon I could do this." I approached the Department of Education and said ... because I was high school trained, and I said, "Can I become a primary school teacher?" They said, "Sure, you're four-year trained. You can teach primary school." So, I just started off as a casual teacher at a primary school, and I was hopeless, completely hopeless at it. I very quickly realised I didn't know what I was doing, so I then started trying to find out how to be a good teacher of primary school children. I particularly like little kids, and I loved ... my passion is reading. I love reading. I love everything to do with literature, so that's really where I wanted to focus my attention. I wanted to teach little children to read, so that they could have as much fun as I had from it. Peter: So, you've been doing that, teaching little children to read, for the last 11 years? Moya: Oh, no, longer than that actually, yeah. Moya: From the time that I realised I didn't know what I was doing, I then took myself off, and the first course that I did was Spalding. You may have heard that name. Moya: A very reputable method of teaching children the basics of reading, based on the Orton-Gillingham model. Moya: That was two weeks in the Christmas holidays, from nine til four, and three hours of homework every night. Peter: Like a crash course? Moya: Very intensive and, for me, everything about it was brand new because I had been a high school teacher, and now suddenly I was learning about phonics. Everything that I was presented in that course was brand new, and I could honestly say that there's been barely a day that's gone by since where I haven't used some part of the Spalding training. Peter: The reading wars, have you taken a side on the reading wars? 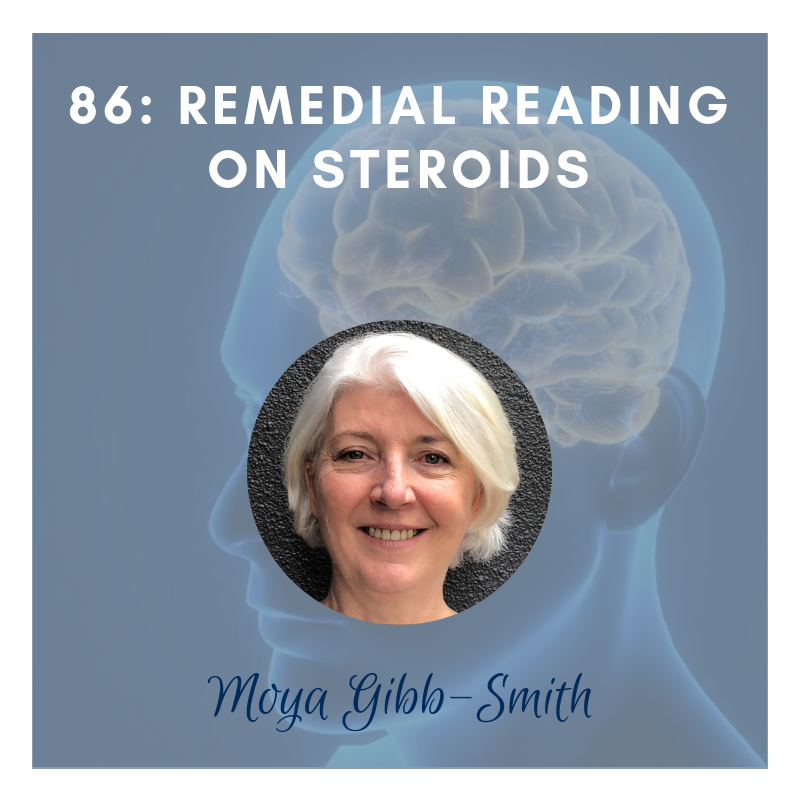 Moya: Oh, I probably sit somewhere on the fence actually because luckily I was a child who was taught phonics in primary school, and then I saw firsthand some of the young teachers coming through, who hadn't been taught phonics, and I could see that they were missing out on things. Yet at the same time, there's something to be said for whole language too. I think there's different ways for teaching different kids. Some things work better for one child, and some things work better for another. But I do believe that you need a basic grounding of phonics, and then you need some wonderful experiences with language and literature and drama and the whole bit as well. I guess that puts me on the fence. Peter: Okay. So, in your time as a remedial reading teacher, I guess that's what we're talking about here. Peter: It sounds like you blended those two approaches. Is that correct? Moya: Yes, and I went on to do other courses that interested me. I trained as a MultiLit provider. Then I did the Davis Dyslexia course. And I learned Letterland by using it with another teacher who was training me up in that. And all of those approaches all had merit. In fact, at my last school, we had a couple of students who were really not succeeding. They were coming in to a small group class that I ran three times a week to improve their literacy. They were kids in First Class. And these two little guys just weren't making any progress at all. And so my principal came to see me and she said, "What's happening with Robbie and Nicholas?" And I said, "Mmm, gee I dunno. I'm doing everything I normally do." Then she went away and I thought about it and I thought, "These children are not going to learn to read unless they get reading practice five days a week." So from that point we started and we set up a reading scheme before school. We used to call it "early birds" and it was staffed by parents and by volunteers. And every morning before school we would see up to 15, 16 children of the morning 4-A, half an hour twenty minute lesson using the MultiLit program. And it was one child to one tutor on a set program. And once we did that, we started to see the children progress in their reading. Peter: Wow, that's great to hear. That was a load on teachers and parents, one-to one. Moya: It was massive. It was like running a whole class with heaps of people in the room coming and going. Once they finished one child they might start another child or they might head off. Parents bringing their children and tutoring their own child, or if that didn't work because of the parent-child combination, a tutor would tutor their child and then they'd take somebody else. And of course I had to train all the tutors in the MultiLit system. It was a lot of work. And we did that for three years. Then, what happened is my husband retired, and he was at home going a bit blue-moldy so he decided to go back to university. And he went back and he did his Diploma of Education. So then, of course we've got a man who's 63 years old and wants to teach full time. But he's a brand-new art teacher, brand new teacher. Peter: So you had some advice for him, did you? Moya: Go west young man. So we went out to Parkes, in country New South Wales, and we bought an old house out there because that was my dream. I wanted to do-up an old house and he wanted to be a full-time teacher. So shortly thereafter we both landed jobs at a catholic school at Forbes. And that's where my journey with Fast ForWord began. Because we had in Year Seven a child come to the school called Lachlan. And Lachlan was a very unusual student. Nobody really knew what to make of him. And one day the principal came to me, we sort of bumped into each other and he said to me, because I was working part-time in learning support at the school, he said, "What are we going to do about Lachlan?" And I said, "Well, brother, there is a very program I know about, I hear it's very good but I've never tried it." And that was Fast ForWord. So he said "Okay, find out about it," which I did and then presented that to the executive, and he made the decision to implement it in the school. So the first year we had 20 students. The second year we had 50 students. And for my money I would have liked every child coming through the gate to have two terms of Fast ForWord. Peter: Wow, why is that? Moya: Fast ForWord was doing what we were doing at my old school in the before-school "early birds" class. But it was like doing it on steroids. It just was so much quicker, so much more effective. The labor intensity wasn't there because the kids do the program on the computer, the program is matched to the individual child. So, if a child makes three mistakes in a row, the program drops down and makes the next question easier. Because it aims to keep them in that sweet spot of learning where they're challenged but not overwhelmed. So every child is on an individual program just for themselves. They're sitting at their computer. They would have headphones on. I would darken the room. I'd pull the curtains down, turn the lights out because I've found the dark room was less distracting to the children. And they would work solidly for 50 minutes. I would be the only adult in the room. And I'd look around and think, "This program is, amazing. It's amazing that one teacher can have this many children working hard on a program designed just for them." Peter: It's amazing! What did the other teachers think of you in this, dark room with all these kinds with headsets on; no noise I presume and you wandering around? Moya: Yeah, I would just wander around and I would check on the children. Each afternoon I would look at all their results and write them a note for what they needed to start on the next morning, or something to keep an eye out for or, "Put your hand up when you get to this exercise and I'll come and give you a hand." So I could just wander around to spend a little bit of time with each child in the class. As far as implementing it in the school, it wasn't all easy sailing. When you introduce anything new to a school there are going to be people who are reactionary, they just don't like change, they don't like anything new, and there were some people like that at the school that I was at. And then there are others who jump on board, are encouraging, begin to see that it's working, and that was the really fantastic thing; when I would have teachers and parents come up to me and tell me how it was helping their children. Peter: Right. This wasn't teaching them to read though was it? You still need teachers. Moya: Oh, absolutely. This does not replace teachers. This is about preparing the brain to learn. It changes, it actually physically changes their brains. It doesn't specifically teach them things. It improves their ability to learn. And we saw that. I remember one teacher coming up to me and saying she had given her class an assignment. It was an in-class assignment. And one of her students, a boy on the First ForWord program, had never, ever, written more than a sentence for her. He handed in half a page. She was, amazed. And she sent me his work so I could have a look at it. We saw miracles happen, we really did. There was one girl who's dad had told me that she was in Year 8 and every afternoon she'd get home, and they'd ask her to do a homework and there'd be tears, and a meltdown. And after she started the First ForWord program, that behaviour eased off and finally stopped. And the thing that struck me is when he said, "The 'blank screen' look has gone from her face." In other words she was finally starting to understand speech at a normal speed. She began to understand everything she heard rather than just about a third of what she heard. Peter: She had some sort of auditory processing difficulty, yes? Moya: Yes, I would imagine that was the issue. And she was one of those students who would come in, do her work, really get through it. She applied herself to the program. And it made an enormous difference to her. It changed her life. Peter: Every child that you were working with on this program wouldn't had auditory processing disorder? Moya: No. We didn't have a specific way to decide who would go on the program really. The first year when we knew nothing about it and we were just beginning, I went to the learning support team and basically said, "Who've you got? Who do you think would benefit from this program?" And so we took the children who were finding schoolwork really tough. The next year, we changed our model a little bit. I went to all the teachers and said, "Who've you got that you think is stronger than they're able to show you?" So they're the sort of kid that may be quiet sitting in the classroom, they try but they never ever get very good results. And those are the kids I think that this could really make a huge difference to. Moya: In the second year? Peter: Yeah, when you put those kids on. Moya: Yes, we saw big changes. I remember there was a mum at the school she had twin boys. And when these twins came into the school, they were in Year Seven that first year that I ran the class. And she said, "Please, one of my twins is weaker than the other," she said, "I'm really worried about him. He's got learning difficulties. The other twin is fine." So, we started with the twin who was weaker, and he did two terms of Fast ForWord. By the Christmas holidays, his brother was asking to do Fast ForWord because he realised that he was losing his advantage. Peter: So, comparing Fast ForWord to those other interventions you mentioned, you tried on earlier on, how do they compare? Moya: All of the programs that I have used in the past have been excellent programs. I have nothing but positive things to say about them. But, Fast ForWord is quicker. It's quicker. It's more direct. It gets to the root of the problems. It fixes the brain rather than just trying to teach reading, which is a great thing, this actually gets to the underlying causes of the reading difficulty. Peter: If you were to give advice to other learning support teachers, who are struggling to achieve big improvements in their cohort of students, what would you say would be the best approach? Moya: I have no hesitation in recommending Fast ForWord. Some people might think initially that it's expensive, and I did. I know I thought it was expensive initially. By the time I had used it for the second year I was thinking, "This program is a cheap as chips for what you get." It is amazing. It's a case of, "what do you spend your precious money, the school money on?" And if you want the most effective program, in my opinion, this is it. Peter: Well, thank you Moya. Thank you very much. Fast ForWord: How Much Evidence is Enough?